Why is Queen a feminist’s delight? I am not a huge fan of watching movies in theatres. I practically detest sitting through three hours of doing nothing but staring at the moving pictures on the screen. But Queen was different, whatever little I had seen in trailers and posters had convinced me that this would be a must watch. A simple yet meaningful story of a jilted woman, Rani, the movie describes to us the series of transformation she undergoes post the called off wedding. They want that they should be the all powering, all dominating nazi forces around. Umm no. In most simple of terms, again NO. 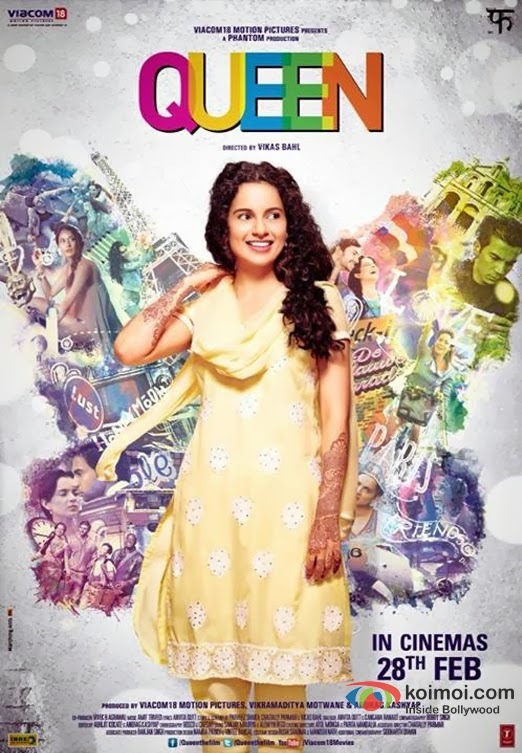 In the movie Queen, Rani goes on her honeymoon to Paris and Amsterdam alone. Experiencing all that she does, she realises that she has been holding herself back all life because someone else deemed it to be. Her choices were never hers to make. This new found sense of freedom changes her mindset and opens her mind to new beginnings. A feminist only wants that hers and her peers choices should be only theirs to make. They believe that short clothes will liberate them. Throughout the movie Rani has nowhere worn any short dress or clothes which may be deemed exposing. In fact right at the end when she returns back to India she is wearing a nice chic kurta which she laughingly tells has been bought in Paris and has written ‘Made in India’. It is a very simple scene but it shows what the story wanted to tell us. Clothes don’t make mindsets. Period. They do not like household chores especially cooking. Umm no. Though some of us don’t enjoy it out of sheer laziness. Rani is a graduate in home science. She even earns money through her cooking in Amsterdam. And yes thoroughly enjoys it. They are man eaters who only want that the entire men race should be wiped off. Rani realises in the end that the called off wedding in fact helped her grow. Her life has opened many avenues not explored because she got an opportunity to discover them. She parts with Vijay on a happier note. Yes she forgives him! Feminists only real vendetta is that women all over should be allowed to decide for themselves. Cooking, shopping biking or mountaineering, whatever it is that they want to do should only be their prerogative. It is when terms begin to get dictated to them that the concerns rise. Ahh I so want to watch this one!!! And I agree all we want is the freedom to chose how we want to lead our lives! Yes you better watch it! Richa , you have well-done to dispel the myths of feminism . I loved them. Makes perfect sense why short clothes will liberate them is a myth. Thanks for dispelling the myth’s feminism. Great share! Interesting – I hadn’t heard of this film, but will look out for it. I think I’ll like this movie. A feminist is sure of herself…it doesn’t mean she disagrees with men or is a men hater! Lovely Michelle and perfectly true! I watched Queen yesterday and it was an absolute delight! Quite a few myths busted there!! It is an absolute delight, true..
Quite an interesting review, from a very different perspective 🙂 And you can’t sit through a movie? Now, this post has further increased my desire to watch this one. And this film has passed the Bechdel Test (The Bechdel test asks whether a work of fiction features at least two women who talk to each other about something other than a man. A popular addendum is that the two women must be named.Many contemporary works fail this test of gender bias. [Source: Wiki]) So, this film should not be missed. P. S. You don’t like watching films in the theatre?!?! The experience, the sound effects, the sheer suspension of disbelief without any interruptions. I pity you Richa. Sad Sad. I’m hearing only good things about the film! And your review just whet my appetite more. Thanks, Richa! Shailaja go and see it, a masterpiece believe me! I believe it is distributed there as well..
Feminists are ones who think men are no good? Lol! Heard a few good reviews about this movie…will try and watch! do Danny and believe me you would love it! Go and watch it soon! And the myths are broken. I so wish to watch the movie. Hope I get a dvd here. Hey u have beautifully highlighted the myths that float around whenever we talk about something feminist. Have been reading so nice reviews that I am all tempted to watch the movie now! You must Shaivi you would love it! I can’t wait to watch this movie!! And yea, so many myths around Feminism… the one that irritates me the most is about clothes and that we hate men! What nonsense no?! haha yes Kokila you must! Yes saw it in the theater and it was worth it. I very much agree with point number 2! I am not a great movie buff either, bt I really want to see this one ! Thats a good one ! I haven’t watched the movie yet, but am willing to now that I have heard so many good reviews from females mostly. True Nupur women all over can relate to it.. I loved this movie… Though I too detest watching any movie in hall, but don’t feel like missing one with good reviews. And promos looked promising to me! Shesha.. It was only your saying that Queen is worth a watch, that I have viewed its trailers. It is on my must watch list. Richa Singh: Your review is convincing enough to make me watch it! Well-written Richa. Now, I want to see the movie. Intrigued to see the movie..! That was a refreshingly different kind of review 🙂 Everyone has been saying this is a must watch, am on the lookout for tickets now. Yes please be on a look out Seeta, you would love it! Loved your review, Richa. Now that I look back on it, I do see the points you have made! Oh lovely! Link by link you broke off the chain of misconception. After reading this I too would watch the movie. And I really found this post nice. I think Feminist or not, this movie is simply delightful….but love the way you used it to bust some popular myth on feminism. I haven’t yet seen this movie and this post adds one more reason for me to watch this movie. I had already read a bucnh of good reviews about Queen. Your post altogether gave me a different perspective. Looks like a must watch !